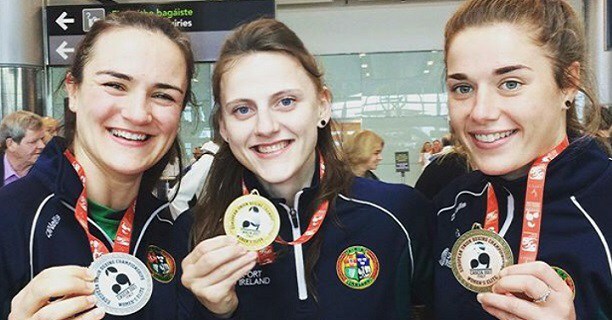 Michaela Walsh and Kellie Harrington had to settle for bronze at the European Women’s Elite Championships in Sofia, Bulgaria today. Dublin lightweight Harrington was beaten on a 4-1 split decision in the semi-finals of the tournament by Finland’s Rio 2016 bronze medallist Mira Potkonen. Neither woman dominated a tight but open bout. Harrington, switching from southpaw to orthodox and back, found the target with crisp jabs in all three rounds, Potkonen responding with solid combinations. Harrington impressed with an excellent left straight right down the middle in the third, but Potkonen, who beat Katie Taylor at the Rio Olympics, again replied with combinations approaching the ten second clapper for the end of the round and the fight, a repeat of the 20017 EU final which the Finn won. The Dubliner will be bringing home bronze from Sofia and also a ticket for the 2019 European Games as the 11th edition of the European Women’s Elites are a qualifier for Games which will be hosted in Belarus. The top ten in the lightweight class qualify. Belfast feather Walsh, the current EU champion, lost on a 3-2 split verdict to Russian feather Daria Abramova, who Harrington has beaten in the past, after a tight and cagey 57kg decider. Walsh landed enough shots in all three rounds, and worked well to the body in the first. Abramova, a stand up and solid fighter, was effective at close range when she managed to find her way beyond Walsh’s jab. Walsh, the current EU champion, got the better of a furious flurry in the final few seconds of the third and final frame, but a majority of judges opted for Abramova who is aiming to become a two-weight European champion. Today’s results bring Ireland’s competitive interest in the tournament to a close. Both Harrington and Walsh will be presented with their bronze medals during Tuesday’s finals. Tel: +353 1 454 3525.